In the running series of people in the field of live visuals that we keep seeing pop up in the VDMX community, and over due for an interview, is Motus.Lumina, a group of audio, visual and interaction designers based in Buenos Aires. In particular they make spectacular usage of a wide variety of tools and work on some incredibly interesting events, such as the 3D projection mapping project in collaboration with Nerdworking that showed up in our Twitter feed not too long ago. Live coding audio-visual DJ/VJ performance. Motus.Lumina is a Buenos Aires based design collective that works on visual programming, indoor / outdoor stage design, VJing, animation, interactive design, video mapping, audio-visual installations and music. Our main objective is to create interactive visual projects integrated with sound, music instruments, data and digital control devices. Motus.Lumina was founded by Temel Hüseyin Kuru a.k.a VJ Vidbeat / Istanbul-Turkey and Claudia Hiroki / Buenos Aires-Argentina. Since February 2015 we are programming audio-visual projects for many artists, musicians, festivals and art collectives from all over the world. 2. What tools (software, hardware, etc) do you use in your creative process? We are using Quartz Composer, Touch Designer, Cinema 4D, After FX and VDMX for creating our visual content. We use 2 15-Inch Mac Book Retina laptop for programming and live performances, Black Magic Intensity Shuttle for capturing video and live mixing and finally for audio-visual works we use Roland Octa-Capture sound card for audio and MIDI input. For most of our audio-visual performances and installations, we are programming our visual content with Quartz Composer. Then we do all the live sequencing, adding video filters and connecting audio, OSC and MIDI signals via VDMX. Generally, our live setup contains generative visual patches programmed with Quartz Composer or Interactive Shader Format. We use video footage only for very specific works. VDMX has a great integration with Quartz Composer and lets us program custom plugins, visuals, FX and templates for our installations and live performances. For the last 2 years, we are using Black Magic Intensity Shuttle to connect our VDMX software and mix between 2 laptops without using a video mixer. Native Black Magic support of VDMX is very handy for live performances. Our visuals are mostly geometric and abstract compositions inspired by sci-fi and cosmos. Using musical data and external tools ( music instruments, HID devices, sensors etc. ) takes a big part in our artistic workflow. According to those needs we are using VDMX as a hub to send and receive all the external data to process our visual content for live performances. Also, it is great to build up custom control surfaces for custom needs. VDMX and Quartz Composer are always the most popular tools in Motus.Lumina studios !! 3. Tell us all about your latest 3D projection mappings in Rome! After we were commissioned by Nerdworking for the Solid Light Festival / Rome we started to program our visuals and start working on a custom Quartz Composer VDMX setup for this project. We modified Kineme GL Stereoscopic plugin for VDMX as a real-time anaglyph 3D plugin – So we achieved to convert all our Quartz Composer and video content to anaglyph 3D without making any render. Also, the plugin lets us switch between different masks and models. Once we have the plugin working we prepared different presets for each episode of our story and recorded our visuals responding to the different audio frequencies of the music track. Another interesting detail was the distance of the object z-axis. After many tests, we have created a holographic anaglyph effect that shows frontal objects floating in the air about 1 meter from the audience's eyes. 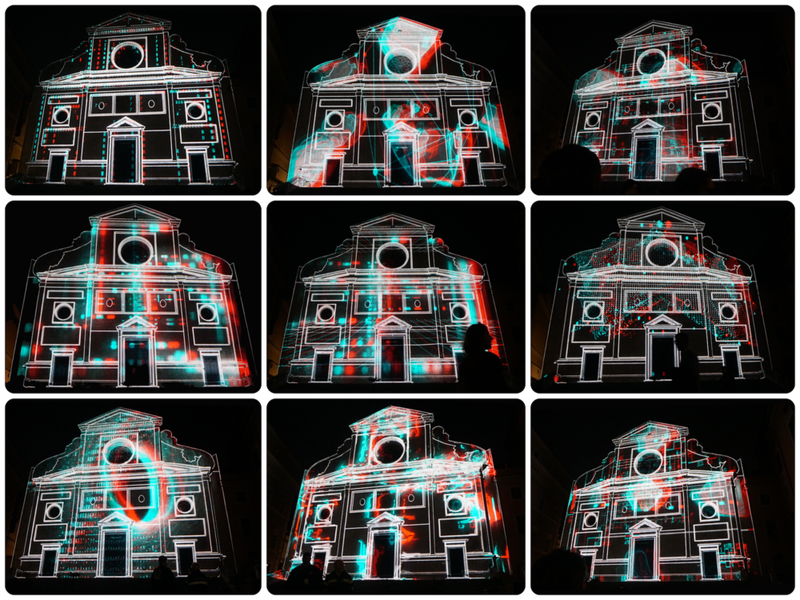 Thanks a lot to Nerdworking and Solid Light Festival for letting us experiment on the walls of beautiful Sant`Agostino church. And thanx to all Vidvox crew for programming and developing VDMX!! You can find more work from Motus.Lumina on their website https://motuslumina.com/ as well as vimeo and instagram.